Tumhari Marium is the story of a young, lovely yet simple lady named Marium. The story revolves around Marium and how her life turned upside down due to a constrained marriage, societal standards, and in-laws� attitude. The story further evolves as it includes three other characters including Marium, Salman and Hasan Sheraz. Marium is stunningly beautiful, but she is not clever enough to handle troubles around her life. Salman is a non-resident Pakistani, who is involved in extramarital relations with Shanzay. Salman�s mother learned about this and somehow traps him into a forced marriage with Marium. For Marium�s family, it was a match made in heaven, but Salman decides to divorce her on their wedding night and leave Pakistan forever. How Marium will cope with this situation? Will Marium suffer the wrath of society norms and standards or will she stand up against this injustice? 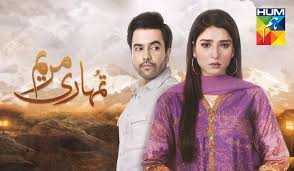 To watch this engaging and heart wrenching drama online, log on to HUM TV�s website.